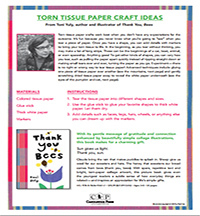 This teaching guide for Thank You, Bees , a book appreciating nature and all it does, includes tissue paper craft ideas. 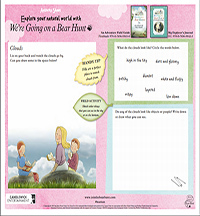 These crafts will help students learn about insects and flowers and how they benefit other animals, the ecosystem, and humanity. Clouds bring the rain that makes puddles to splash in. Sheep give us wool for our sweaters and hats. The honey that sweetens our bread comes from bees (thank you, bees). With spare, repetitive text and bright, torn-paper collage artwork, this picture book gives even the youngest readers a subtle sense of how everyday things are related — and inspires an appreciation for life’s simple gifts.